Our recent re-visits to the Fei Fei Wanton Mee at Joo Chiat and Pasir Panjang outlets change our opinion about Fei Fei Wanton Mee completely, used to be one of the best wanton mee in Singapore, the legendary of this stall has gone downhill that we wonder what have gone wrong with the mee here. The one at Pasir Panjang is a complete disastrous with excessive sourness from the vinegar with overcooked noodle, totally deviated from the nice noodles we had long ago. We made another trip to the Joo Chiat main branch but realised it has gone and we have to settle for the next Fei Fei Wanton Mee outlet shop that is few shops away. Unfortunately, the standard has dropped so much that it is just not worth to mention anymore, overcooked noodle and chili sauce was featureless, what else can be more worse? Fei Fei Wanton Mee is obviously walking on the thin ice. A Cantonese noodles widely available from Hong Kong to Malaysia and Singapore. Slight variations from country to country with red chili based seasoning one the most common in Singapore, other version include the black sauce type but less common here. I would very much like to review the black sauce Wanton noodles as well but the moment when the topic was mentioned, the answer was always not too motivating “you go and try yourself.” So, what can I say? No choice, just have to wait for the right kaki. There are too many good Wanton noodles in Singapore and this is real big problems to decide what to make up the top few. 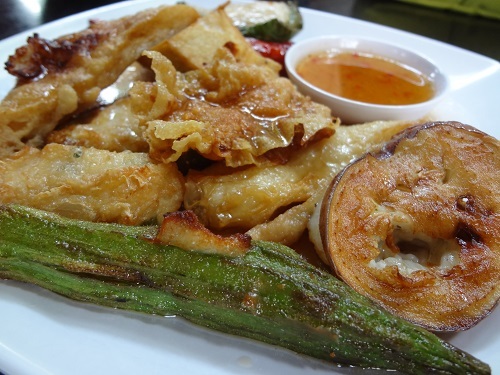 After years of eating and reviewing this dish, we have painfully dropped the rest and select the best few, sorry to those fall out of the list but we can be certain many not mentioned here are equally good. We will definitely expand the list as time goes. 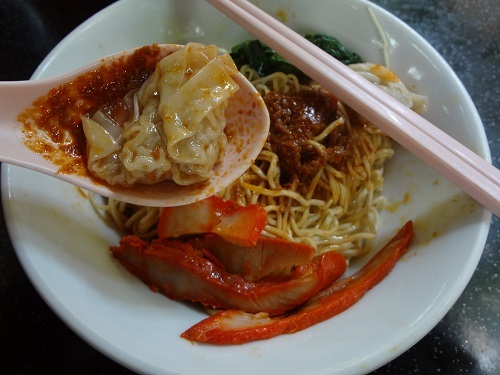 Not everyone goes well with Fei Fei on their popular Wanton mee, when food concern, the great taste sometime also depending on personal preference. My daughter loves Wanton mee and that allow us to go around looking for the best one just to satisfy her craving of the favorite noodles. (Good dad always), she is somehow inherited her parents’ gens when come to food and always demanding the best and critic about the quality. Of course, how can we miss this stall with so much of the publicity. Fei Fei Wanton Mee at Joo Chiat Place probably would be one of the popular choices by many foodies if you mentioned wanton mee. So, what’s make this stall so outstanding? 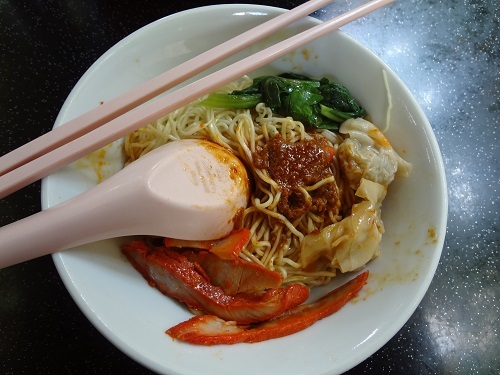 The “pale” looking noodle was our very first impression with Fei Fei Wanton Mee. The noodles is less yellowish compared to all other wanton mee in the market, perhaps less lye (Sodium hydroxide) was added to make the noodles! So, good news as a start, though, you may think it is too plain or pale and who really care about colour, the taste come first. Anyway, the “pale” noodles after mixing with the chili sauce looked much appealing, amazingly, the texture of the mee is pretty good with the right level of elasticity and QQ to the bite, to attain this level of the quality requires the good control of the cooking process in order to create the right bounciness of the noodles and not the soggy type that obviously overcooked, Fei Fei makes it. 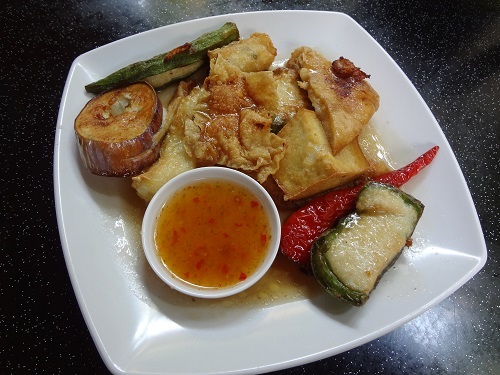 We ordered the Yong Tao Fu as the side order, all pieces were lightly “deep” fried to retain the freshness of the ingredients, go very well with the plum sauce chilli, we like it. D phone no change liao where d place?? The standard dropped drastically and not sure worth if worth the trip. Yes, the standard drop tremendously when i was there last Dec. Even the services was lack luster…i definitely think it’s sub-standard now.